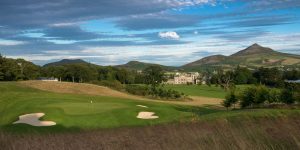 With two championship golf courses set in stunning surrounds at the world-renowned Powerscourt Estate, Powerscourt Golf Club is an immensely popular venue for both Irish and international golfers alike. The estate boasts two championship golf courses, Powerscourt East & Powerscourt West. Visitors are welcome 7 days a week, add to that friendly staff, outstanding facilities and excellent dining, it’s not hard to see why so many flock to play their courses. The East Course at Powerscourt offers something for everyone, it is an incredibly enjoyable round of golf which includes being able to play over water. The East Course offers a breath-taking view of the Powerscourt Estate and its stunning surroundings. The West Course offers a completely different feel and test, bringing David Mclay Kidd’s experience and detail for a challenging, rewarding and highly enjoyable golf course to life. The beautiful scenery and greens from the West course will often be talked about from visitors who want a second chance at it. Both courses are immaculately presented, with some of the best-kept greens around. Talk to your concierge or contact the Golf Club directly to book on 01-2046031.